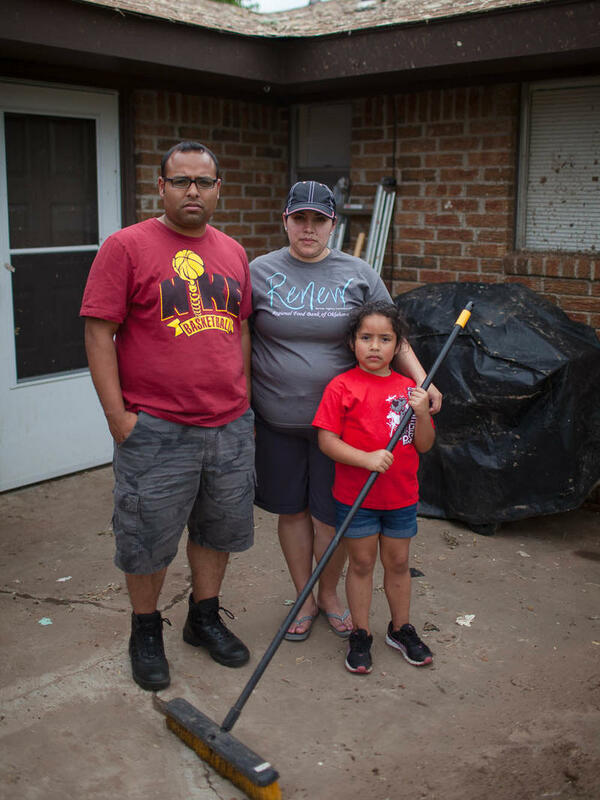 HANSI LO WANG, BYLINE: And I'm Hansi Lo Wang in Central Oklahoma, the heart of tornado alley, home to one of the fastest growing Latino populations in the country. Producer Marisa Penaloza and I spent some time these past few days looking at how this community has been coping since the storm. WANG: Pastor Chano Najera calls out T-shirt sizes in Spanglish to volunteers waiting for their uniforms. It's easy to spot Najera in this crowd. Just look for the cowboy hat. NAJERA: I'm a John Wayne and Ronald Reagan fan - Gene Autry, Garth Brooks and all those cowboys. NAJERA: Go buy a safe box. Keep the most important papers and documents and whatever they have in the safe box. NAJERA: Dig into the ground. You know, bury it. Protecting birth certificates and passports and other personal documents is especially important for immigrants. Besides tornado tips, Najera tries to encourage community involvement amongst Latinos who may feel like they don't belong. What we try to tell them is, no, no, no. You need to be part of it. Don't exclude yourself from the process. We are part of the community. WANG: Dozens of volunteers from Chano Najera's disaster relief team arrived in Moore. 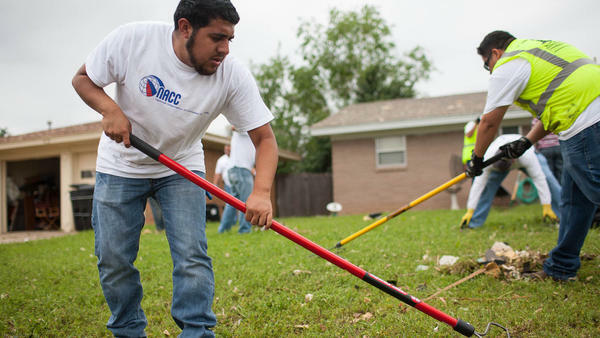 One group set to work raking storm debris from a front yard. Eli Sanchez and his family of four live in this neighborhood. The foundation for their brick home moved during the storm and left cracked walls inside. The tornado was even less forgiving to Sanchez's parents, whose home in Moore was leveled by the storm. Sanchez says the one thing his father - an immigrant from Guatemala - hoped to recover was his American citizenship certificate. ELI SANCHEZ: He was proud of that because he framed it and he put it on the bookshelf for everybody to see. WANG: Eli Sanchez's wife, Maria, says she understood her father-in-law's wish because she just became a U.S. citizen herself. MARIA SANCHEZ: I came here illegally, but I was 2. You know, I was 2 years old. WANG: Maria Sanchez was born in Mexico, and she says she hasn't forgotten the barriers facing undocumented immigrants. SANCHEZ: The first thing is the mentality, the mentality of fear. You know, I'm scared to go ask for help. WANG: It's an all-too-familiar kind of anxiety for undocumented immigrants like this woman, Amelia. WANG: We're not using Amelia's last name because she's an undocumented immigrant from central Mexico. She cleans offices to support her and her 8-year-old daughter. They lived in a trailer home in Moore that was in the path of last week's tornado. When the storm came through town, Amelia rushed to pick her daughter up from Plaza Towers Elementary School, and they took cover under a bridge. Amelia says it's a miracle that she and her daughter survived. But they still lost nearly everything. WANG: I was desperate, Amelia says, but also afraid to ask for help. But she knew she had no choice but to take the risk. It took her three days to build up her courage. And she got in her car, talked to church volunteers and went to a public health clinic for counseling. She even approached an official and asked how the government could help rebuild her life. She said she can't imagine having done any of this before the tornado. WANG: But now, Amelia says, I no longer feel alone, and I no longer feel afraid of anyone. Hansi Lo Wang, NPR News, Oklahoma City. Transcript provided by NPR, Copyright NPR.